The math behind one of the stock market's biggest success stories. In fiscal 1972, just after Wal-Mart (NYSE:WMT) went public, the retailer booked a respectable $78 million of revenue across its 51 stores. Today, it generates almost $500 billion of sales through 11,500 locations and a large online presence. More than 260 million customers passed through Wal-Mart's retailing doors last year. The company founded by Sam Walton credits its extreme focus on low prices for helping it grow from a tiny regional player into a global retailing titan. The entire half-century trip -- with the exception of the most recent past -- has been enormously rewarding for shareholders. I'll touch on that slowdown in a moment, but first here's a look at how well early investors made out with a Wal-Mart stock purchase. Wal-Mart stock started trading on Oct. 1, 1970, when the company offered 300,000 shares to the public at a price of $16.50 per share. That $5 million initial market capitalization translates into about $31 million in today's dollars. 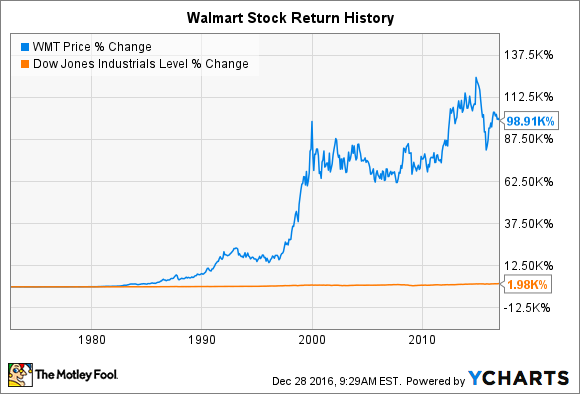 Considering the company is now worth over $200 billion, it's fair to say that a Wal-Mart investment has outpaced both inflation and the broader stock market. Wal-Mart has had 11 two-for-one stock splits since its initial public offering, so that 100 shares purchased at the IPO price of $16.50 (for a total investment of $16,500) would today amount to over 200,000 shares and $14 million of equity. As that math suggests, the stock-price run has produced many millionaires over the decades. The biggest winners have been Waltons, who, for the last three years, have topped Forbes' listing of the richest families in America. But there's much more to the total-return picture than just capital appreciation. Wal-Mart has paid -- and boosted -- its dividend each year since 1974. The annual dividend most recently hit $2 per share, or just under half of the company's annual earnings. Wal-Mart's newest shareholders haven't enjoyed blockbuster returns. In fact, the stock has trailed the market over the past three-, five-, and 10-year periods, but adding dividends into the picture makes the stock a winner over the last decade. 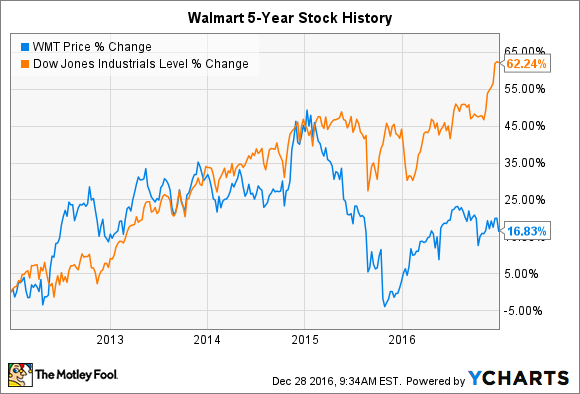 Investors turned especially bearish over the last two years as Wal-Mart suffered from a period of customer traffic declines that it responded to by boosting spending on the shopping experience through initiatives like raising wages and stocking more products on shelves. These changes helped traffic levels begin inching higher again -- at the expense of profit growth. Operating income last quarter slumped by 11%. Meanwhile, Wal-Mart still routinely lags rival Costco (NASDAQ:COST), which is enjoying about twice the retailing-titan's sales-expansion pace. The warehouse giant also focuses on offering the lowest possible price to customers, and its traffic growth only recently slowed after six-straight years of 4% or better gains. WMT 5-year stock history data by YCharts. While it fends off market-share threats from Costco and other discount retailers, Wal-Mart also must face major challenges from online competitors. Over the last decade, e-commerce has surged from accounting for 3% of the retailing industry to more than 8%. Much of that growth has come at the expense of traditional retailers like Wal-Mart. In response, the company is plowing investments into its online infrastructure, with $1 billion of spending slated for 2017. However, it's far from clear whether that spending will deliver long-term returns. E-commerce accounted for just 0.2 percentage points of Wal-Mart's 1% sales uptick in its most recent fiscal year. Investors considering a Wal-Mart purchase today are looking at a much different business than the one that went public 46 years ago. Most importantly, its growth options are limited by its massive size and by unfavorable retailing trends. On the other hand, Wal-Mart's scale gives it considerable benefits, too, including massive resources that it can devote toward improving its position with shoppers both in its stores and on the internet. The next half-century will no doubt involve vast changes to the retailing industry, but it's likely that Wal-Mart's approach of price leadership will still be resonating with customers decades from now.